“Bokeh” is a photography term that refers to the background focus of a photo. Typically a bokeh background appears to have circles of white or light coloured. As card makers it is fun to replicate this look as a technique on a card background. On today’s card, I’ve got more of a “faux” Bokeh technique. 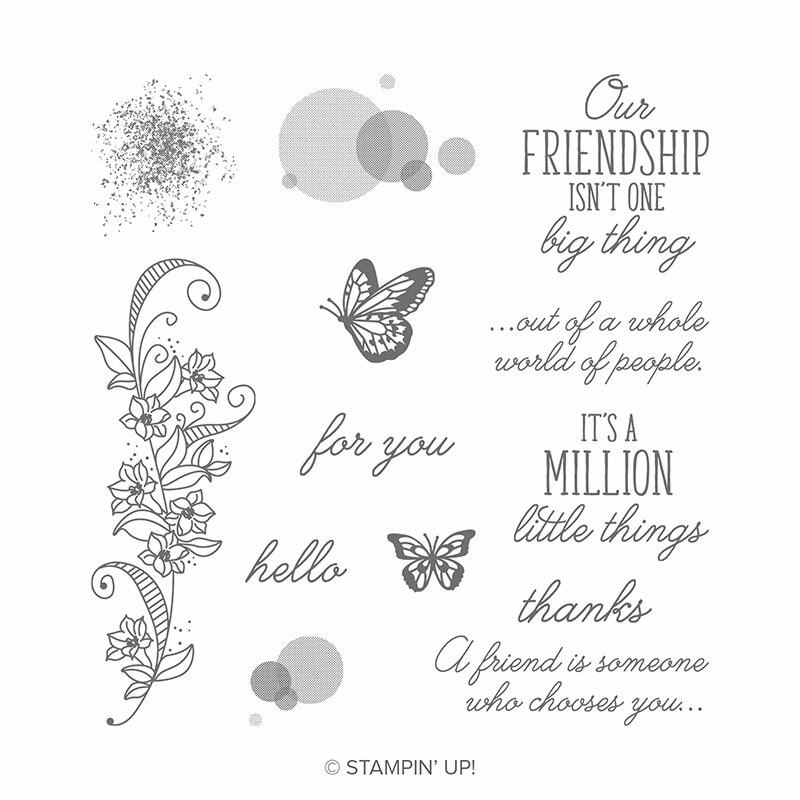 The Bokeh technique is so easy to do with the Beauty Abounds stamp set from Stampin’ Up! This stamp sets includes some circle images that have varying degrees of intensity. So simply stamping these images give the Bokeh look! I got this gorgeous card in a demonstrator cards swap and I love how the Bokeh background has been masked. Die Cut or punch a square out of scrap piece of cardstock. Position the scrap paper, with the cut out square centred, over the white card stock. Hold the scrap paper firmly in place or tape the edges down with removable adhesive. Stamp the two different Bokeh dot images from the Beauty Abounds stamp set into the square using Coastal Cabana ink. 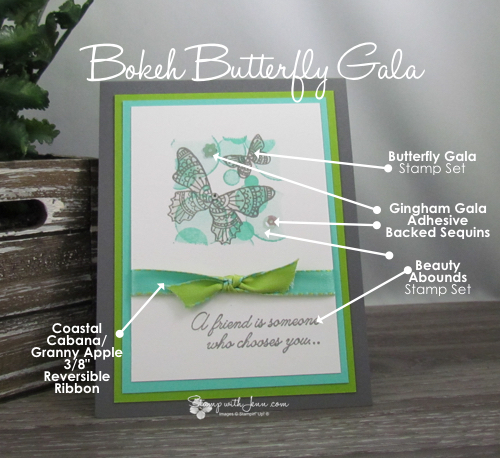 Remove the scrap paper mask and stamp the Butterfly images from the Butterfly Gala stamp set in Basic Gray ink. (see the full list of supplies at the end of this post). 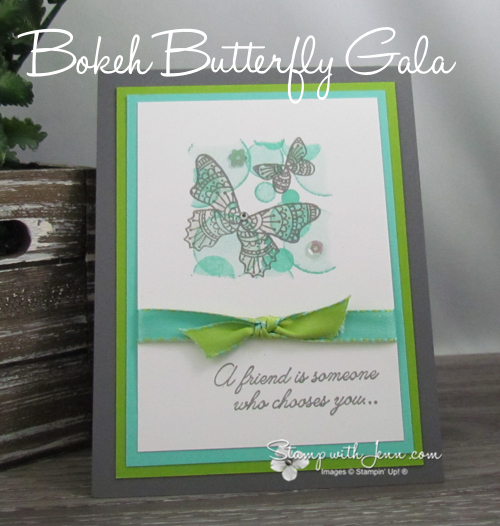 The ribbon on this card is the beautiful Coastal Cabana/Granny Apple Green reversible ribbon. This ribbon matches perfectly on this card as the long piece of of the ribbon matches the Coastal Cabana ink and the card stock and the knotted side of the ribbon matches the Granny Apple Green card stock. 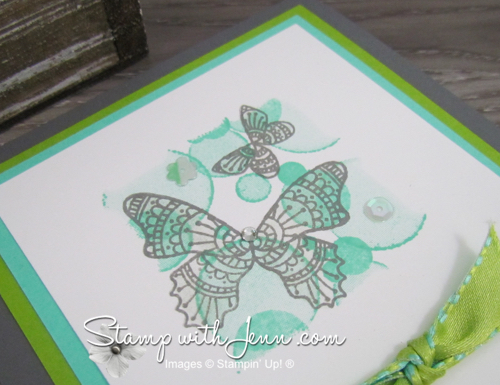 The reversible ribbon is from the Stampin’ Up! Occasions Catalogue and it is currently on low inventory. You can shop for the ribbon here or by clicking any of the product images listed at the end of this post. The colours on the ribbon are a goregous colour combination, especially paired with the Basic Gray and the Whisper White. 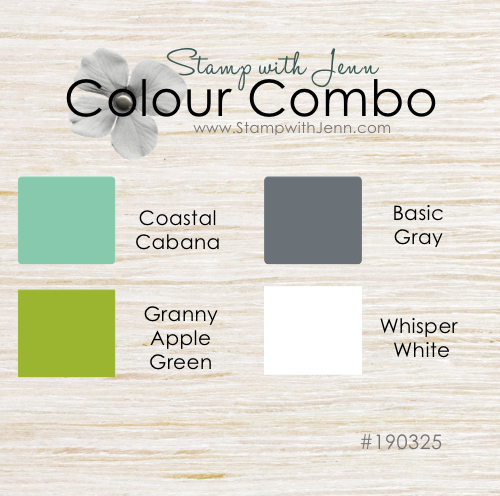 See some other colour combinations ideas HERE on my Colour Combo Pinterest boards. You can see another card on my website, with a Bokeh Background and a different technique, here.